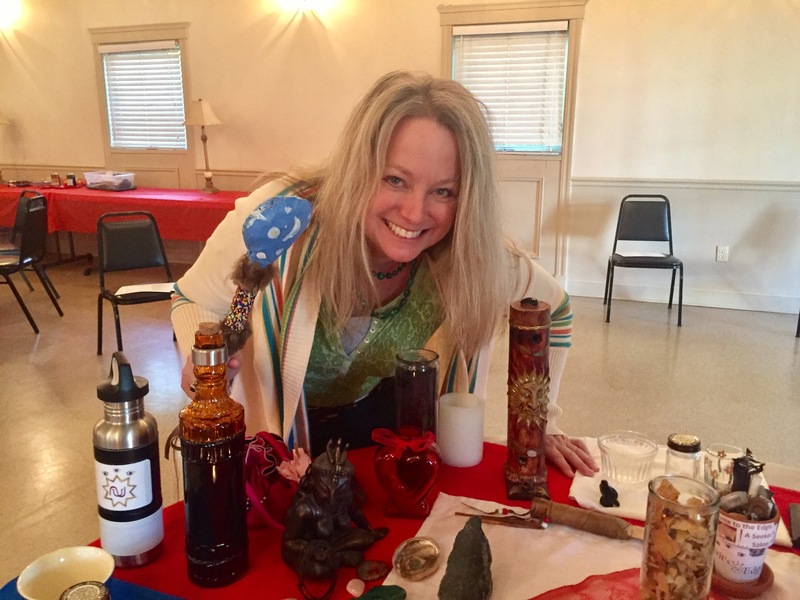 The St. Louis Pagan Picnic program book supports this amazing pagan festival in our community, and I wanted to share with you the essay I donated to the 2016 Pagan Picnic book. For more info on the Spirit’s Edge Shamonial Temple’s booth at this year’s Pagan Picnic, please join our Spirit’s Edge Booth at Pagan Picnic public event page. The theme of this year’s Pagan Picnic is “community connections” – a beautiful representation of what brings us all here together, year after year. 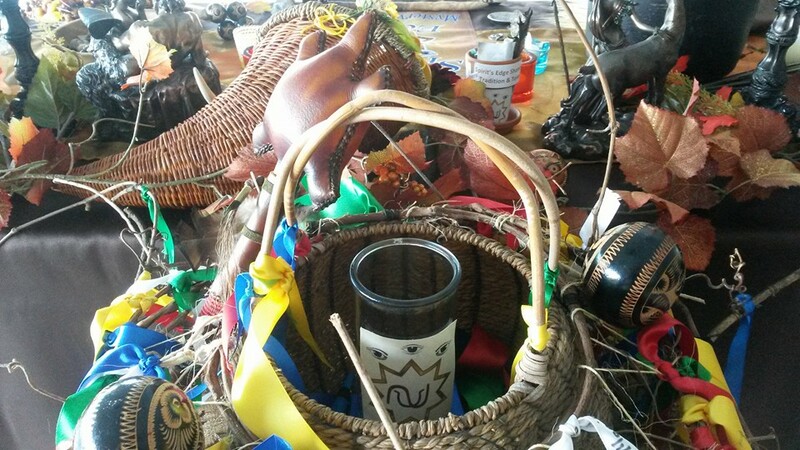 It is reflective of the amazing opportunity that Pagan Picnic provides us to further the threads of our community, to build and grow our connections to one another. As a community of spirit-filled beings, we hold the sacred flame, lighting the torch in the darkness and shining it on the path yet to be forged. The thread yet to be woven. Though we are each on our own separate journey in this lifetime and responsible for our own paths, paradoxically, we are all part of the One. Therein lies the Mystery. Separate, yet one. 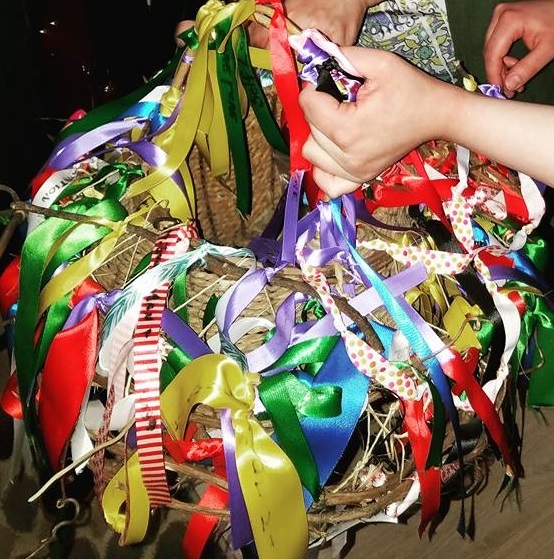 At the 2016 Spirit’s Edge Shamonial Temple Mabon Ritual, our community added purple ribbons, love and blessings to the “Cauldron of Community” to foster a beautiful and harmonious greater pagan community filled with love, as a follow up to the 2016 Pagan Picnic Opening Ritual. Each thread we weave impacts the web for us all. Together we create the web of community, creation and of life. We can fill our being with Spirit, fill our essence with light and share that flame with others, helping to spark their torch in the darkness. They, like us, are the keepers of their own flame, responsible for their own light, and can further choose to stoke that fire or flame to share their light with others as well. How do you spark your flame? How do you share your light? What words do you choose? What story do you create? What threads do you weave? One touch is sometimes all it takes. Not a physical touch, rather it is reaching out to someone else, listening, endeavoring to seek understanding. Walking around Pagan Picnic, connecting with others, listening to each other, sharing with each other. A kind word. An answered question. A friendly smile. Endeavoring to understand each other’s thoughts and perspectives. Accepting and honoring each other and our respective paths and journeys. Not attaching to our own story, our own creation, but also honoring the creations of others around us. Our word creates our universe. It is appropriate that “Spider is the guardian of the ancient languages and alphabets” (Ted Andrews, Animal Speak). One touch, one word on the web, and that one moment of creation reverberates throughout the web. Its vibration spreads. The fire of Spirit is ignited and begins to spark the flame for others. We share that vibration with all those around us, all those connected to us on the cosmic web, the web of universal life. The Web of Life. The Weaver and the Web. The Great Goddess spins and weaves the threads of creation. Old hymnals and verses also reference the idea of the Singer and the Song as part of creation, the word of the Great God creates and sings along those threads. Yet they are also our threads, and our words, our songs – that of the divine, the Goddess and God within us. They are also the songs we share as community on this web, whether we come together in celebration in ritual, sing in our cars spreading joy to others as they see our laughter, or come together for song in the Bardic Circle at Pagan Picnic. The divine creates, as do we. We are creators in our own lives. 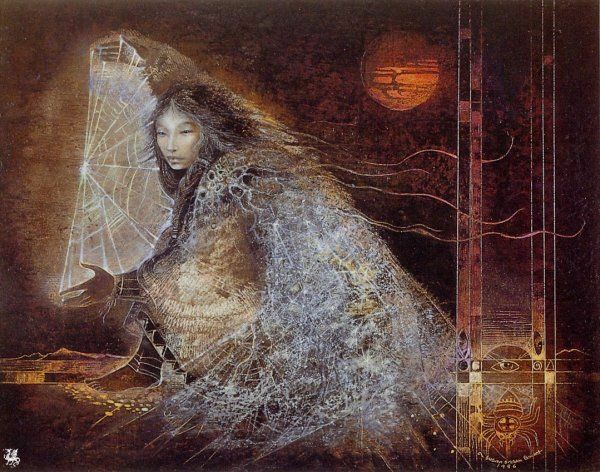 We weave our own threads, just as the Great Spirit, the Divine Creator, the Great Weaver, the Spider Goddess weaves the web of all creation. We are the Welsh Goddess Arianrhod, spinning the silver threads of the universe on her Great Silver Wheel. We are the Greek Spider Goddess Arachne, weaving for eternity. We are the Native American Grandmother Spider, bringer of fire, wrapping us in her woven blanket of love by the communal fire. We are the Moirai, the three sisters, the Three Fates of Greek lore – Clotho spinning the thread of life, Lachesis measuring the thread of life and Atropos cutting the thread of life at death. We create, measure and cut the threads in our own lives. We seek to spin webs of harmony, peace and love and endeavor to remove threads of harm. We first do the work within ourselves. We review and re-weave the web of our own lives, creating our story anew. As we make those inner changes, cutting the threads that no longer serve us and spinning the threads of new blessings and connections, our inner change in turn manifests outside of us. It changes the fabric of the great web itself. We send ripples throughout the web to share with others. We illuminate the threads so that others may follow. Picture from Spring 2017 after our purple ribbons were added, as well as more ribbons added by others in the Greater St. Louis pagan community. 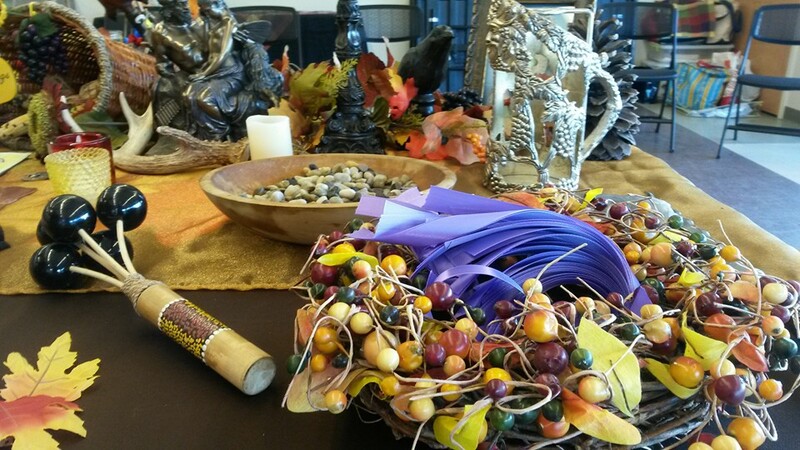 … At the Spirit’s Edge Shamonial Temple 2016 Mabon Ritual, our community added purple ribbons, love and blessings to the “Cauldron of Community” to foster a beautiful and harmonious greater pagan community filled with love, as a follow up to the 2016 Pagan Picnic Opening Ritual. We are the weaver, and we are the web. This is reflected in a beautiful and powerful chant by Shekinah Mountainwater… “We are the flow. We are the ebb. We are the weaver. We are the web.” We weave the most beautiful tapestry. Each unique, beautiful color, each flaw and imperfection, each word creating the rich tapestry of our lives, our community, our world and the universe. Not just in the present, but also in the past and future, as we connect with the helping compassionate spirits, our guides and ancestors through time – as all times are one time and all places are one place. If you look with the eye that does not see, the eye within, your vision eyes, you can see the lights of the universe, of universal life energy pulsing along the Web of Life. You can see the lights strung in the most beautiful and fiery pattern, as if the stars themselves were pulses of light and energy on this web. One of my most beautiful visions of this web came on a spiritual pilgrimage to Glastonbury in 2011 in the Chalice Well Gardens, which I wrote about in the anthology book The Waters and Fires of Avalon. Here is an excerpt of my journey. Spider has a prominent place on our Spirit’s Edge Shamonial Temple altars, such as this one from Ostara 2017. 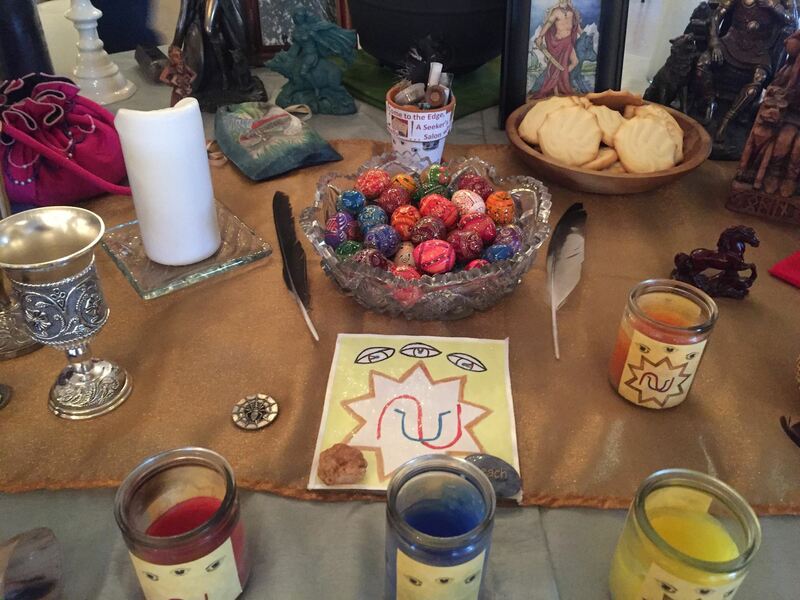 We call on Spider as part of our call to the Great Spirit, lighting the candle in our Cauldron of Spirit. On the last night of our Glastonbury pilgrimage, we stood surrounding the Chalice Well, connecting with the Witches, Mages and Shamans that stood in that place before. Our web of connection spreading out to the present, the past and the future. We opened up a vortex within the Well, connecting with the ley lines. The ley lines themselves appear and act as a web of energy crisscrossing the Earth. I dropped into the Underworld, and the woman in red approached me. She handed me a scroll. Phoenix was on an altar behind her, in its colors of brick red, royal blue and temple gold. The Phoenix merged within me; I had invoked the Phoenix. Its wings shot out of my arms, and its head through my head. We merged with the energy of the four fixed astrological signs in the middle of the vortex, creating a web of color and light. May there always be peace between us. This is a significant statement of connection, of community. No matter our individual paths, our group paths, our community threads, it is a critical foundation to building a beautiful web of community on this path, in all paths and anywhere we go in life. Honoring and respecting each other on our own unique paths. Creating and weaving love and peace. Sometimes spiders build communal webs. Sometimes spiders build individual webs. Some webs are simple, some are elaborate. Some spiders do not even build webs. And that’s o.k. Some threads are sticky, some are slick. Some are dry, some are wet. Some are thick, some are thin. Each type of thread serves an important purpose. It takes all types of threads. It takes all types of webs. All threads and all webs ultimately connect to each other. All is separate, and all is one. It takes all of our unique ways of being to weave and create this beautiful tapestry of life. The more we are aware of the connection between us, between our own personal webs, and those of our own spiritual families, traditions and temples, and the greater world around us, the more successfully we can build our community – together. All it takes is one touch to make a connection. A touch of understanding. A touch with compassion. A touch with love. A community of peace. This place of community where all is one and all is possible. May there always be peace between us. Blessed be. Please be sure to buy a program at this year’s Pagan Picnic when you attend to help support Picnic, which is on June 3-4! Look forward to seeing you at Picnic!